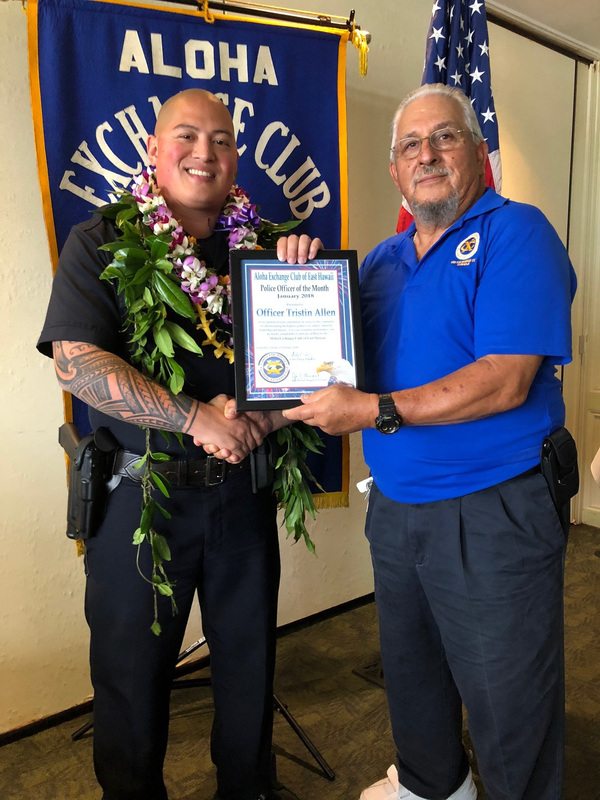 Officer Tristin Allen, has been selected as the Aloha Exchange Club’s January Officer of the Month. On (December 19, 2017), at approximately 5:50 a.m., Officer Allen, and other Puna patrol officers responded to a report of a weapons incident in the Leilani Estates subdivision. The initial call was that the reporting person had heard several gunshots fired, followed by a female screaming. Responding officers while en route were updated that a 25-year-old male had been shot by a 33-year old male suspect who fled the area in a blue SUV. Upon arrival at the scene of the shooting (while tending to the gunshot victim, who sustained multiple gunshot wounds) another responding officer received information from the 25-year-old male that the suspect had a weapon and had forced (at gunpoint) his passenger, a 30-year-old female to exit his vehicle and get into the suspect’s vehicle. Responding officers (who were now facing a hostage situation), canvassed the area making checks for the suspect’s vehicle. Shortly after that, Officer Tristin Allen observed a vehicle matching the description of the suspect vehicle at a nearby street and aired that information via radio to other responding officers. Following an active and lengthy standoff with police that involved the expedited response of the Special Response Team, Crisis Negotiators and officers from the Criminal Investigative Division (CID), the 33-year old male subsequently shot himself in an apparent suicide attempt, ending the standoff. Fortunately, the 30-year female and the four juveniles that were at the residence were unharmed. Officer Allen had placed himself in great danger, as it was later determined during daylight hours that his police vehicle had been shot numerous times throughout the standoff with a high-powered rifle wielded by the suspect. 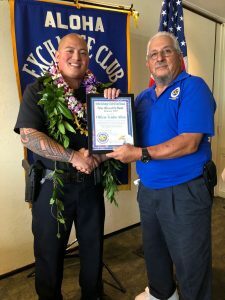 Through his actions, Officer Allen reinforces his commitment to the Hawai`i Police Department Core Values of Integrity, Professionalism, Compassion, Teamwork, and Community Satisfaction.